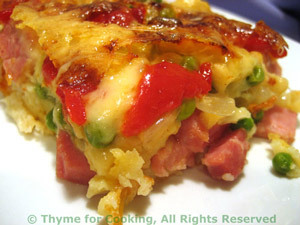 Thyme for Cooking Sunday Supper: Popover Pie with Ham and Peas. 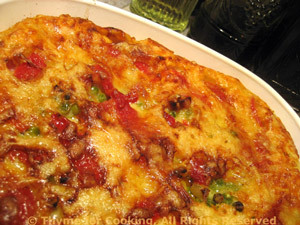 One could call this a Savory Clafoutis or a Popover Pie or a Yorkshire Pudding Pie. What Americans call popovers, the British call Yorkshire Pudding and it's basically the same batter used to make the French stone-fruit desserts called Clafoutis. Whatever.... It's easy.